Please add $6.00 for shipping & handling. Two children enjoy quality time with Jesus in this painting, Jesus Our Friend. Jesus Our Friend copyright© 2002 by Frances Hook is prohibited from being copied. All applicable copyright© laws apply and are reserved by Frances Hook. 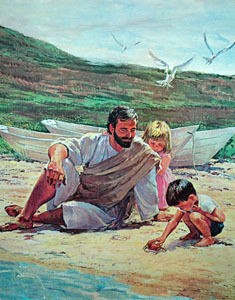 Frances Hook art, Jesus art, jesus with children, jesus playing with children, artwork, art work, canvases, images, paintings, pictures, and prints of Jesus Our Friend by artist Frances Hook for sale. Jesus Our Friend painting by artist Frances Hook can be purchased in art print form at special sale prices at Christ-Centered Art.